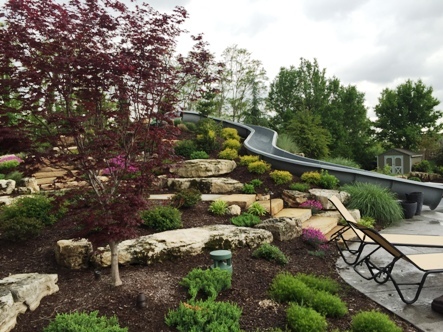 Spotlight on Aching Acres Landscaping of Evansville, IN | Dolphin Waterslides, Inc.
Aching Acres Landscaping, located in Evansville, Indiana is proving they know what they are doing in the pool and landscape design industry. Dan Fuquay and his sales associate Brian are all about amazing landscaped settings and creating gorgeous pool oasis. 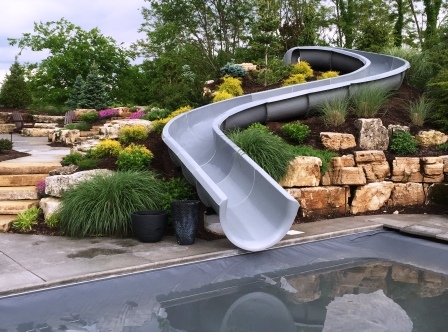 Click on the Link to see the area this water slide takes up and the overall specs on the slide as installed, by Dan and the team. This slide is Medium Grey in color and is 44′ in length. We love to show off how well our builders can blend both beautiful scenery and fun factors together to create some of the most inspiring backyard pool paradises. Check out their Website and their Facebook page, for much more info on Aching Acres Landscaping. If you live in their service area of Indiana, and parts of Illinois and Kentucky, can and tell Dan and Brian you want a Dolphin Water slide in your pool for the next season!.